We headed out to A Bear and Bison Inn, a beautiful mountain retreat in Canmore at the base of Lady McDonald Mountain. 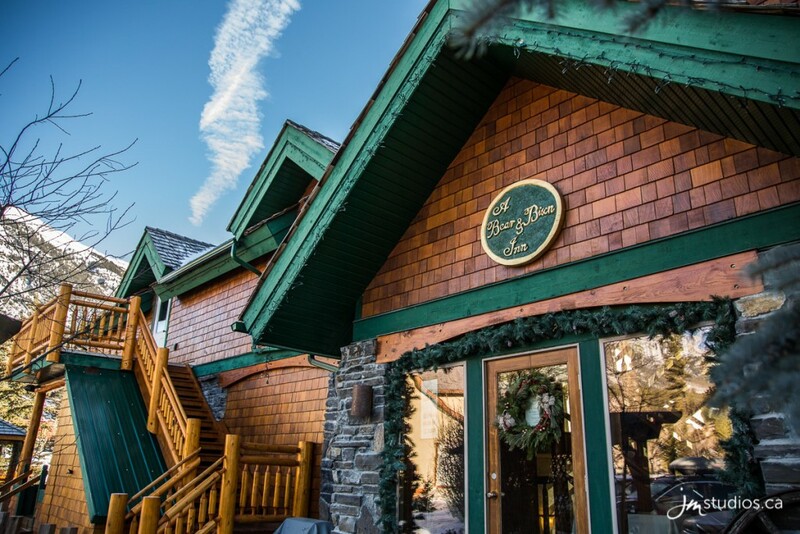 The inn features ten guest rooms, each with a spectacular view of the mountain ranges surrounding the valley. 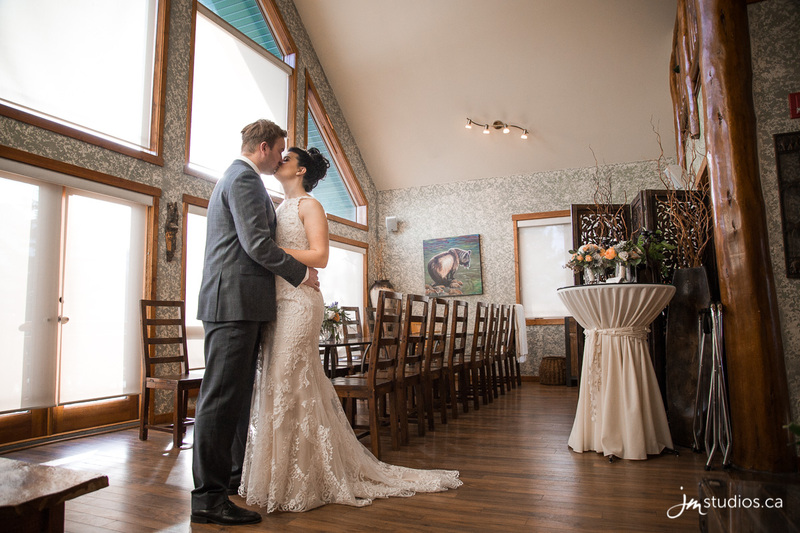 It is an intimate and luxurious place and was a fantastic setting for Erica and Luke’s wedding. 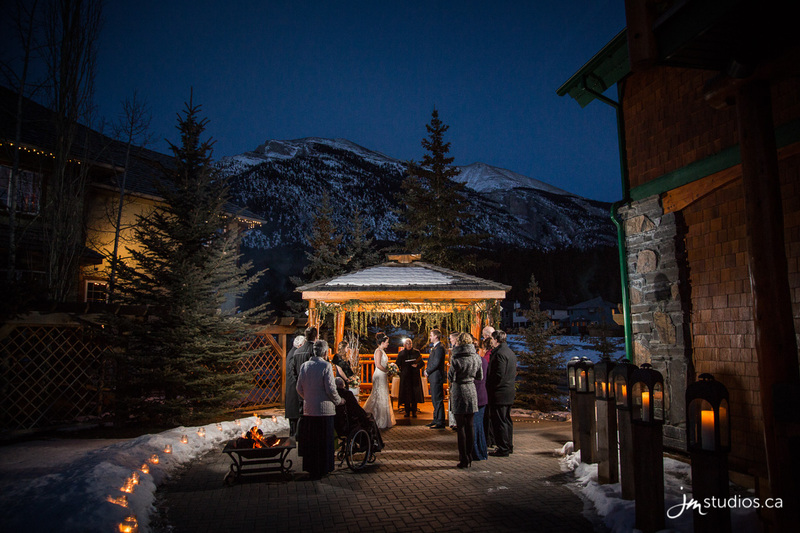 Leah, the coordinator at the inn, put together a fantastic wedding. 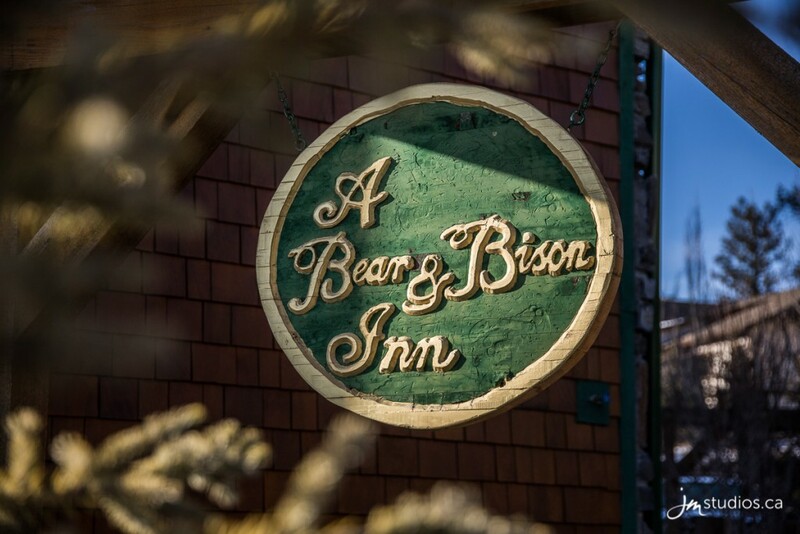 Because Luke and Erica’s wedding was small and intimate, everyone was able to stay at A Bear and Bison Inn. Erica’s brother and his wife recently had a beautiful baby boy, and he was a super cute addition to the party. He seemed to love the camera and was all smiles every time we saw him. When we arrived, the guys were pretty much ready to go. Down in the walkout basement, the three guys were already suited up. 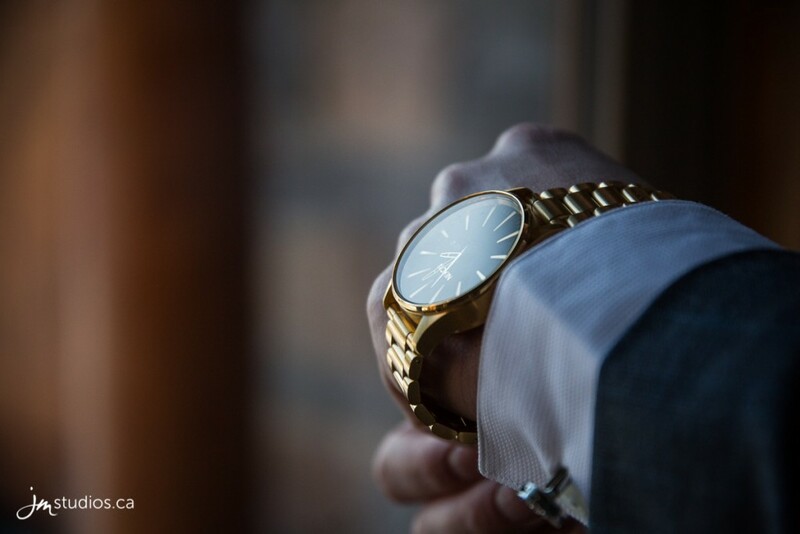 We got some shots of Luke in front of the window fastening his cufflinks and putting on his gold watch. 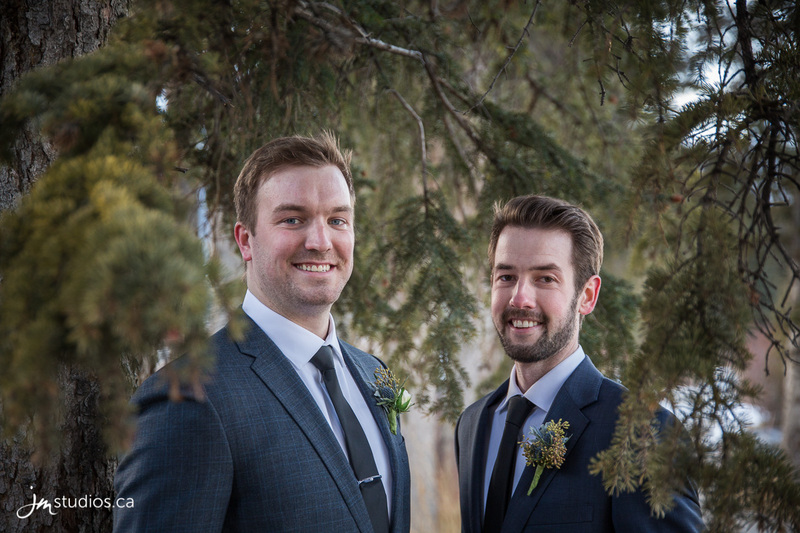 With the help of his brother and best man Mathew, he straightened his tie and put on the finishing touches. We even took some photos of Luke showing off his Star Wars socks. 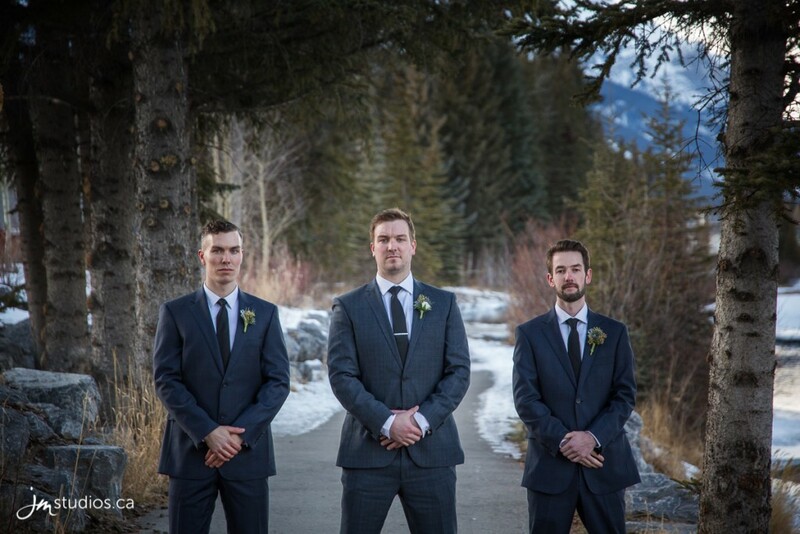 Out on the walkout porch, we stood the guys against a few different backdrops and took some group photos. Leah then led us upstairs to where Erica and the girls were getting ready. 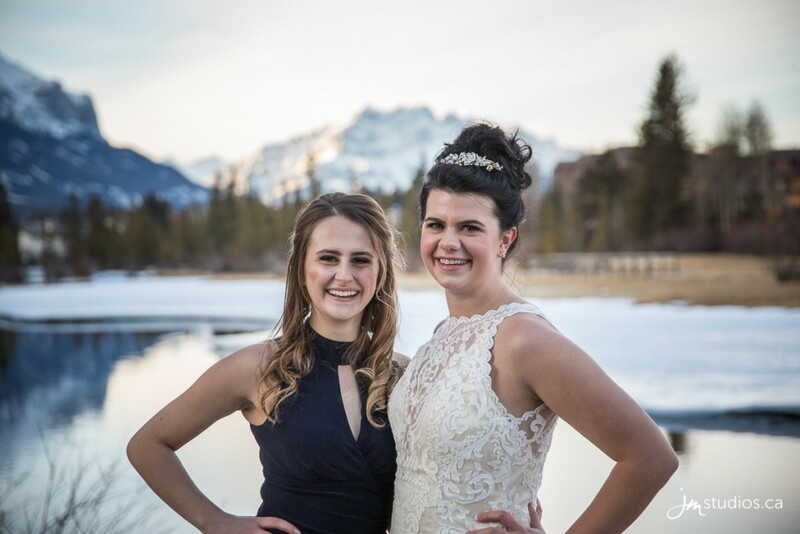 Her mom, her two sister-in-laws, and her maid of honor Brianna joined Erica. She was also ready by the time we joined her, her hair and makeup already complete. 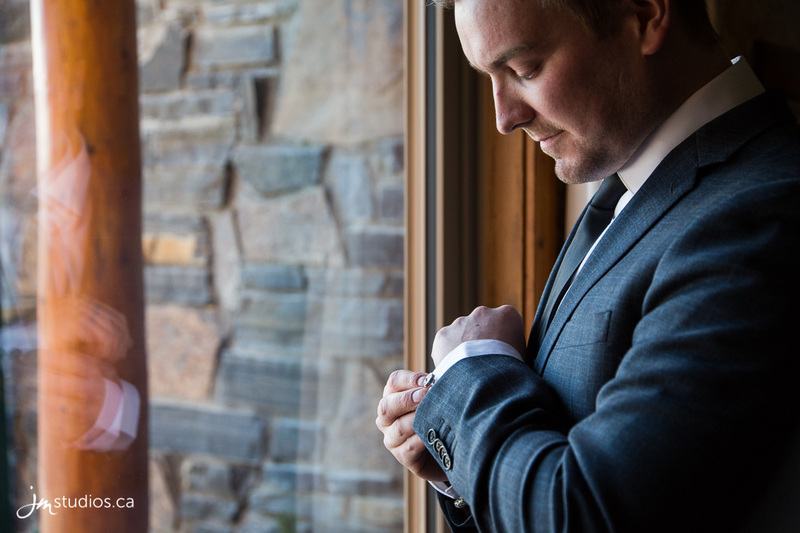 We did some photos of the details; including a beautiful broach that Luke’s mother gave her. 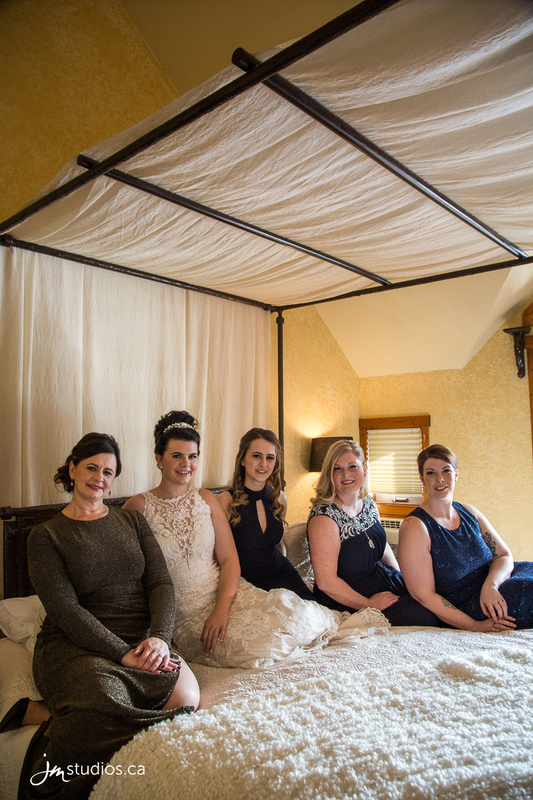 The women all sat upon the canopied four-poster bed for some group shots. The girls then helped Erica button up her dress. 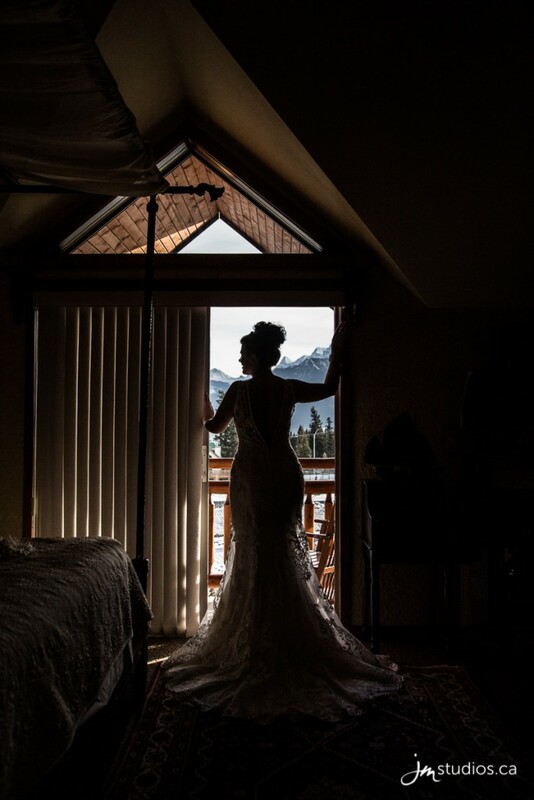 Once in the beautiful gown, Erica stood silhouetted against the window, overlooking the mountains. 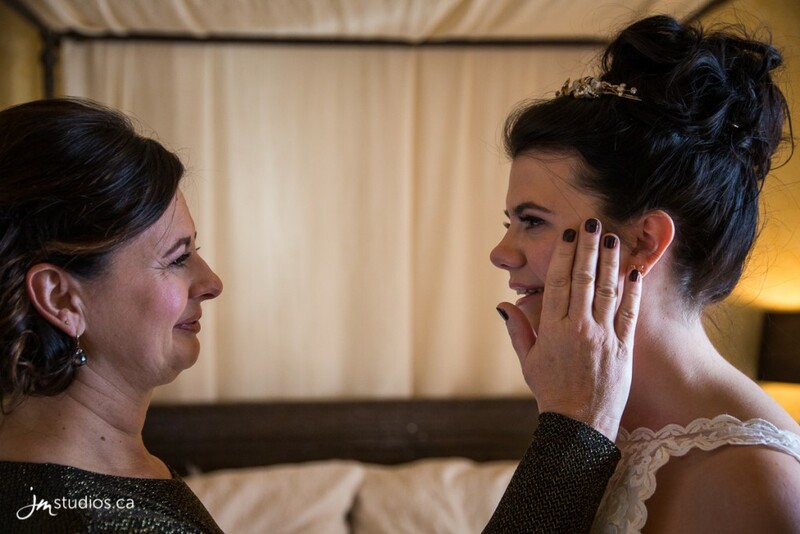 Before heading down for the first look, Erica’s mom requested a shot with her daughter. She wanted a photo in which she was saying something touching, but she couldn’t seem to get the words out through the emotion. Regardless, we got several beautiful shots of mother and daughter sharing this moment together. 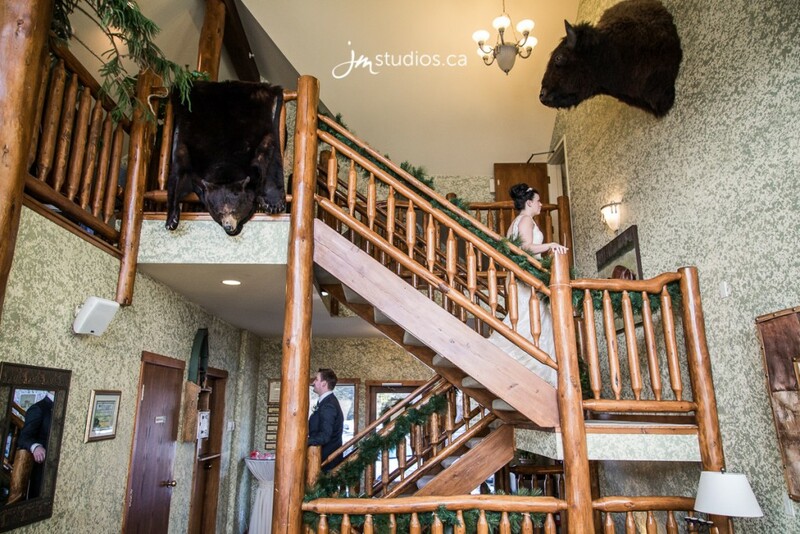 Next, we headed downstairs for the first look. 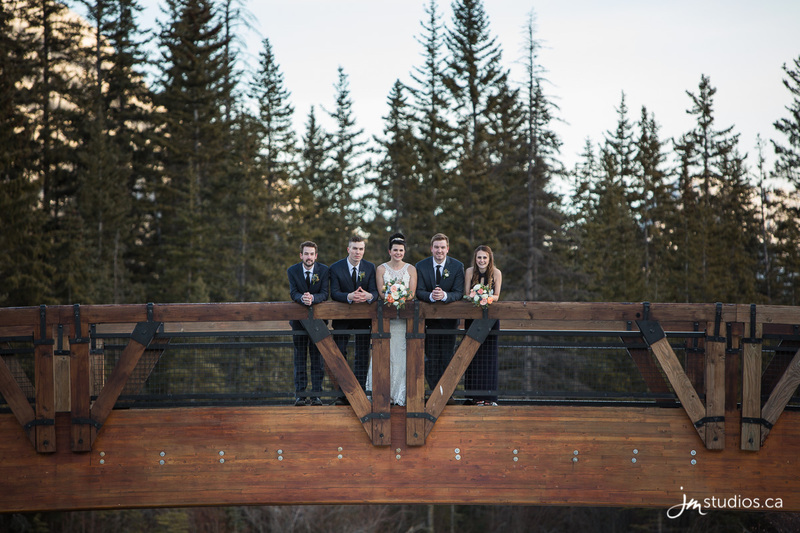 The guests headed out to the main entry, leaving Luke alone at the bottom of the beautiful wooden staircase. Erica descended, her beautiful lace gown flowing behind her. When she reached Luke, she tapped him gently on the shoulder, and he turned to see his bride for the first time on their wedding day. 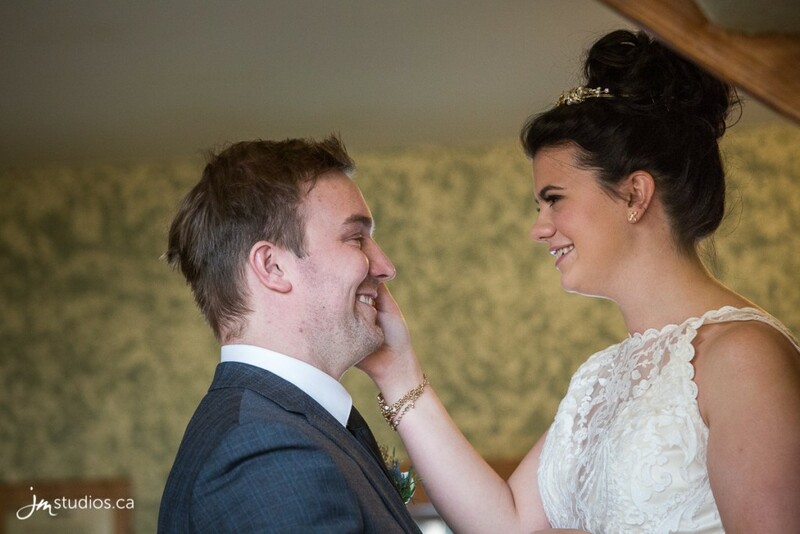 It was a very emotional moment for the two of them. 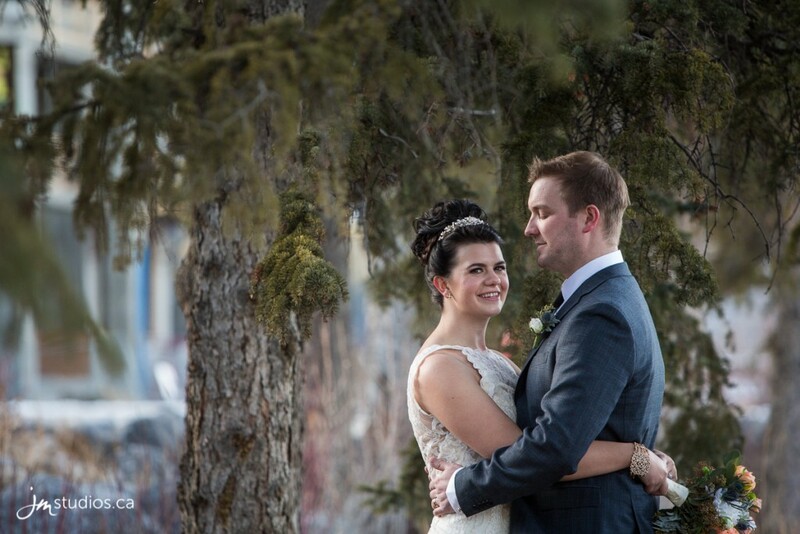 For the formals, we headed 5 minutes up the road to Policeman’s creek, which was an amazing location. 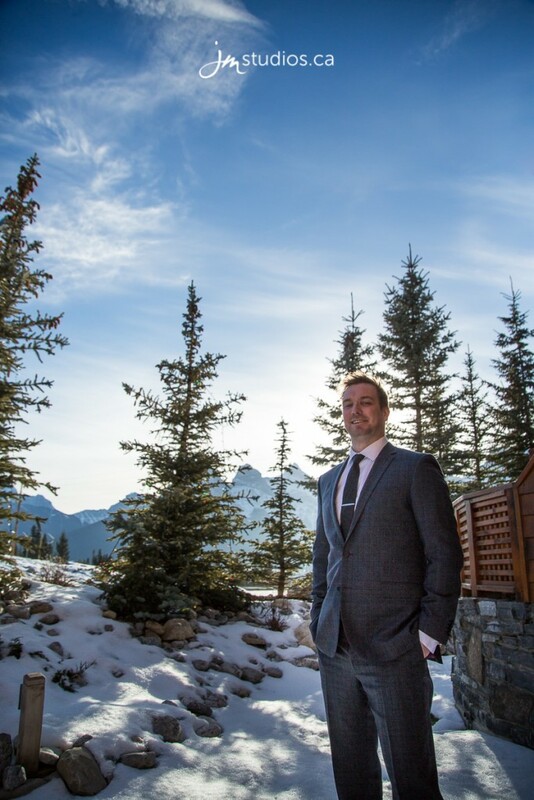 We didn’t have to go far to get a ton of amazing shots and backdrops. 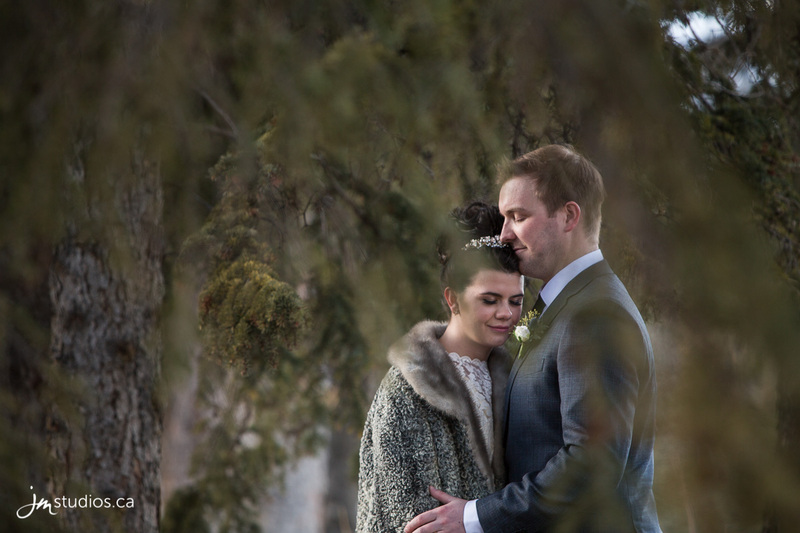 Starting the session next to the river, with Erica wrapped in a warm fur to beat the chill. 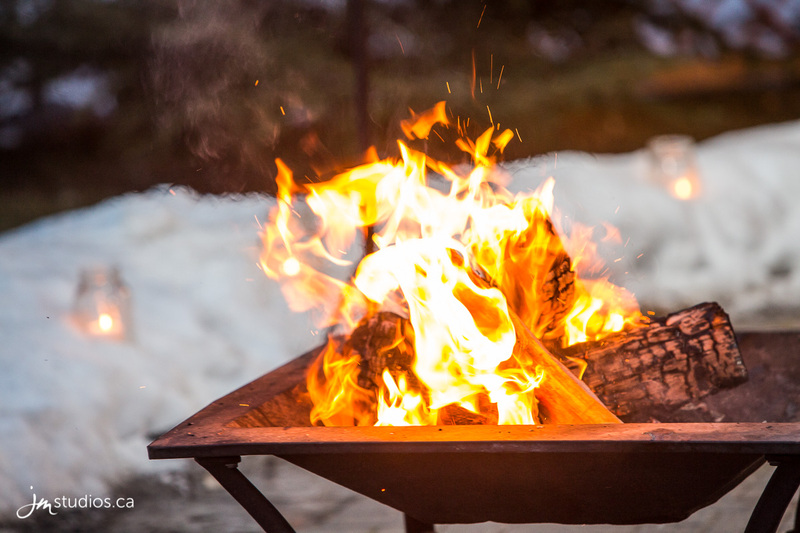 Though it was mid-winter, the weather was 3 degrees Celsius, which made the decision to shed the coat a little easier. Nearby, on the pathway, we settled them into the evergreens for a few more photos. 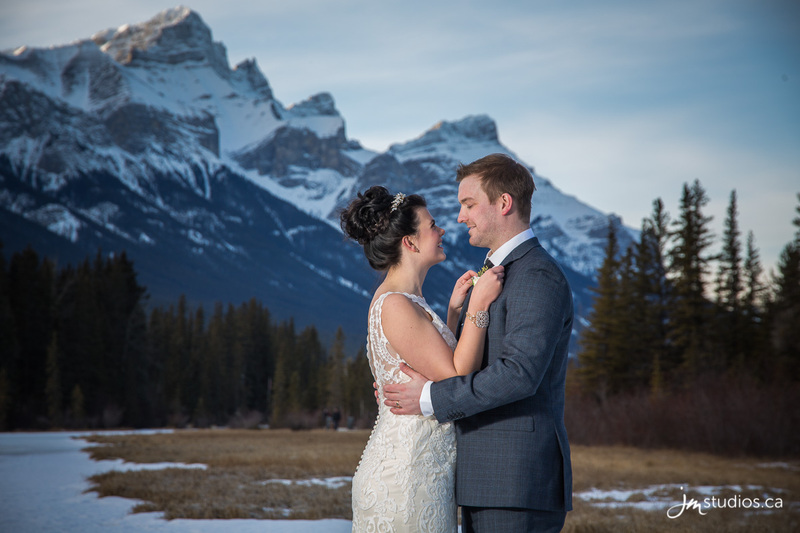 Then we added the wedding party and took a variety of pictures against the beautiful wintry mountains. 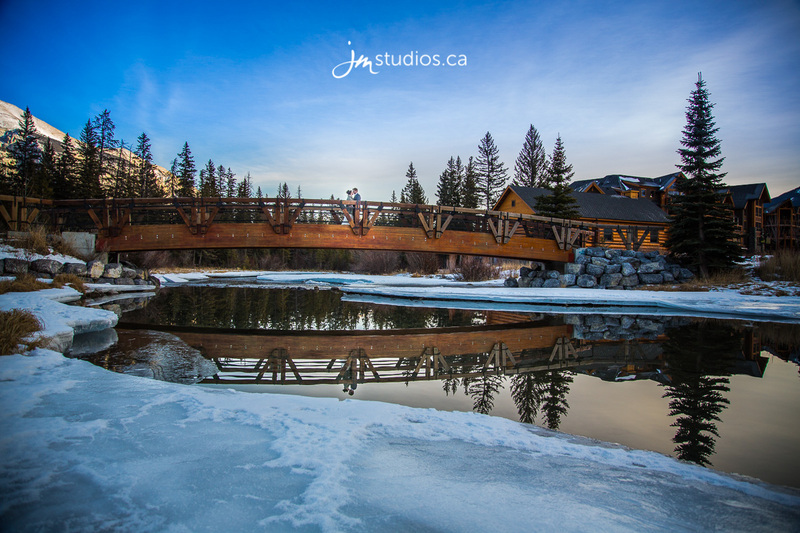 An elegant wooden bridge on the creek was the perfect place for some reflection shots of the exposed water. 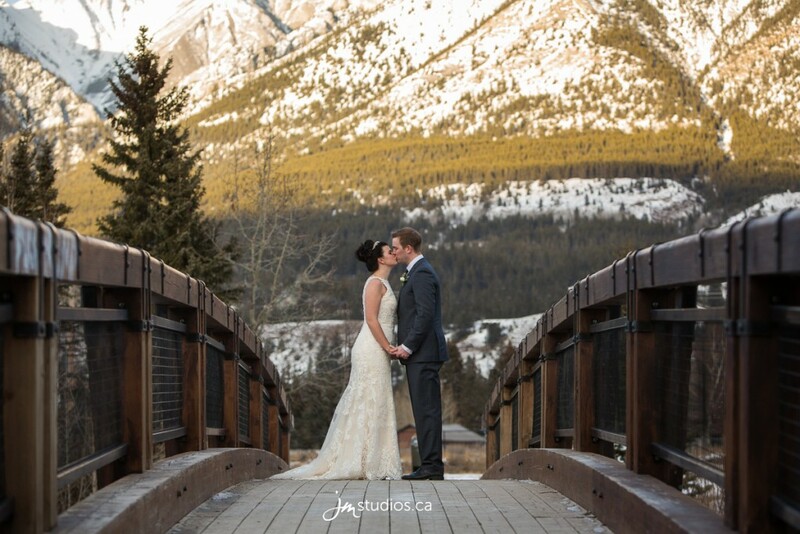 As the sun began to set, we against set them in front of the crisp mountains. 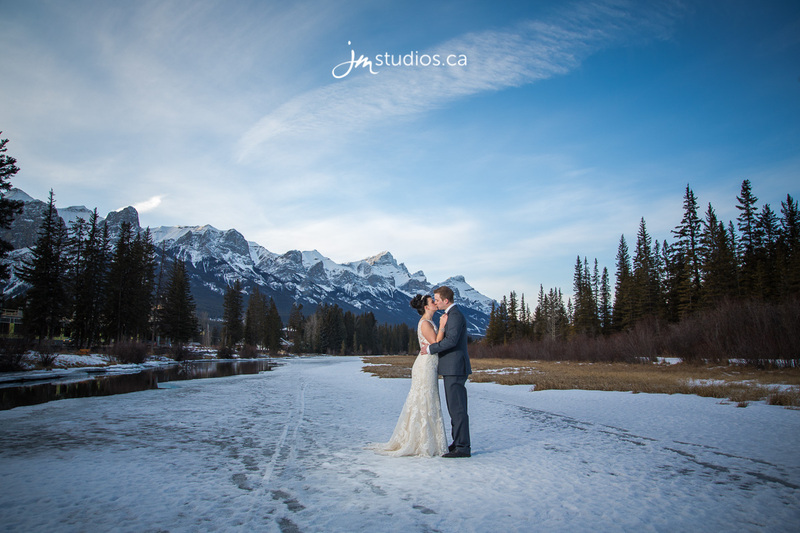 Luke and Erica were feeling adventurous, and so, braving the ice, they shuffled out onto the frozen river. 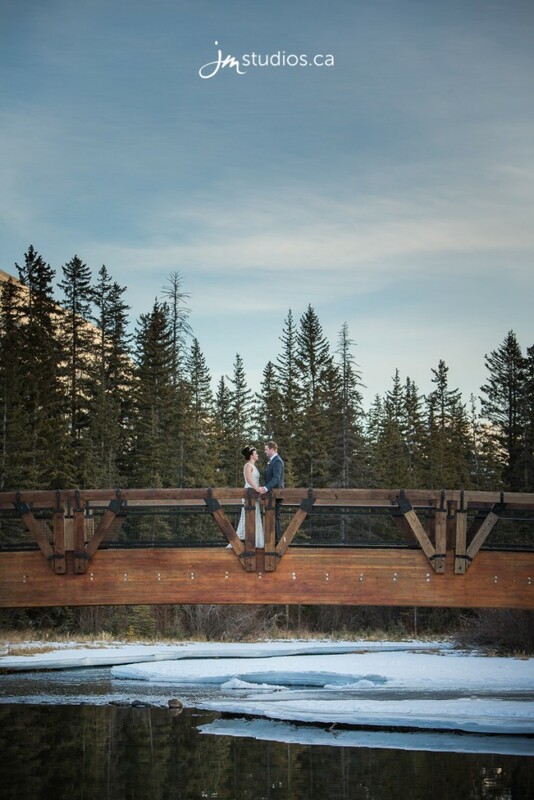 The resulting photos of them in the valley are stunning. After a few intimate photos of Erica and Luke back on the bridge, we returned to the inn. 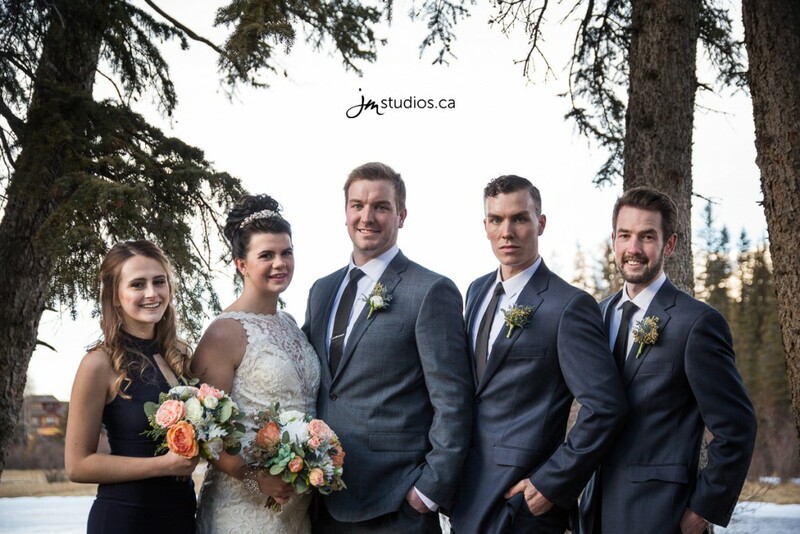 The family was ready when we arrived, and we grabbed some big group shots in the beautiful foyer. 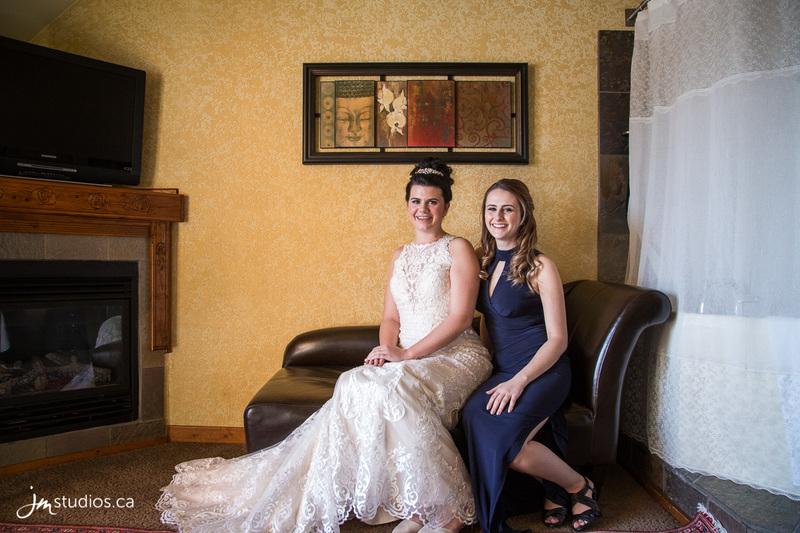 We used the grand staircase and leather couches as backdrops, which made for excellent photos. 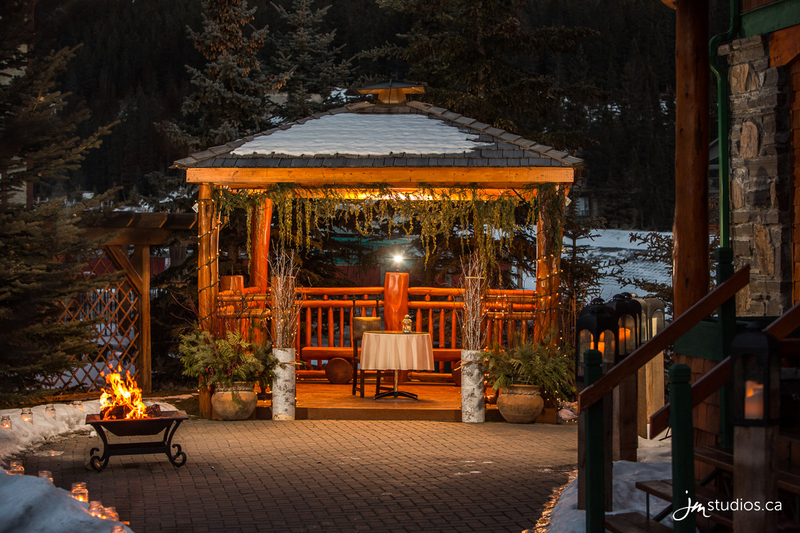 One of the best things about A Bear and Bison Inn is their beautiful gazebo. It sits outside and overlooks the incredible Rocky Mountains. 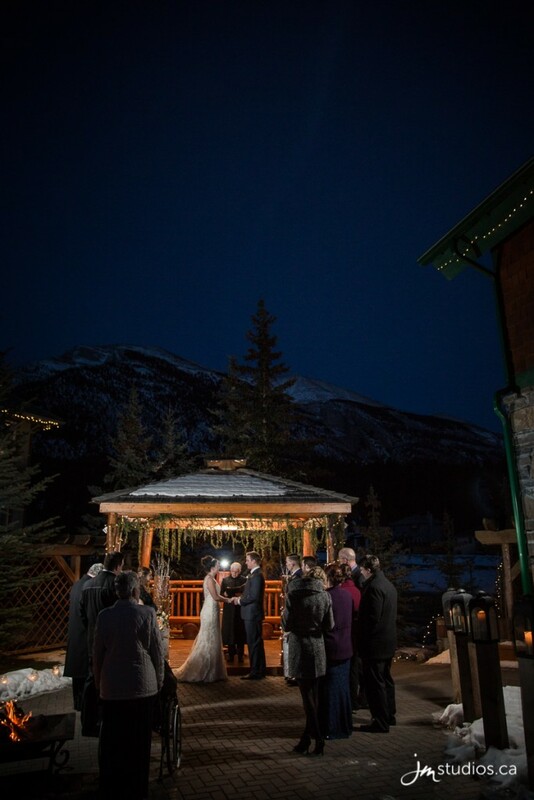 Here they hold unique sundown ceremonies, beginning the service as the sun dips behind the mountains. 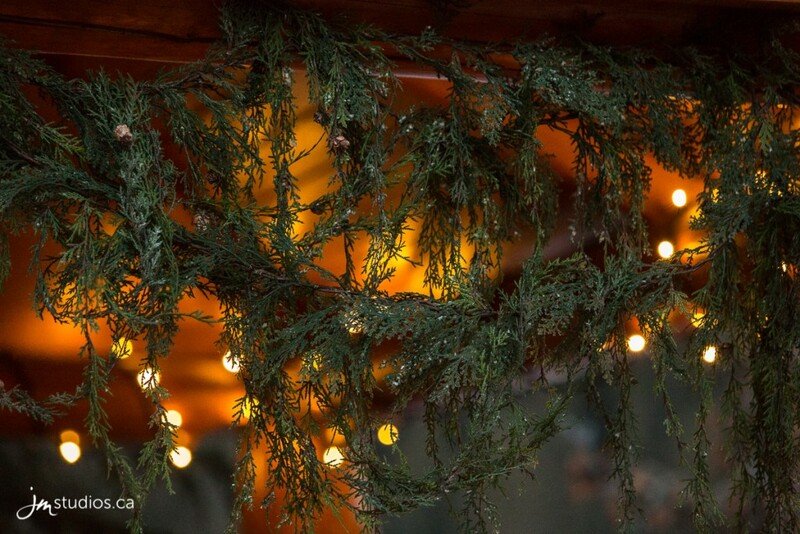 In that magic hour, they light countless candles, jars, and twinkling lights all around the gazebo. 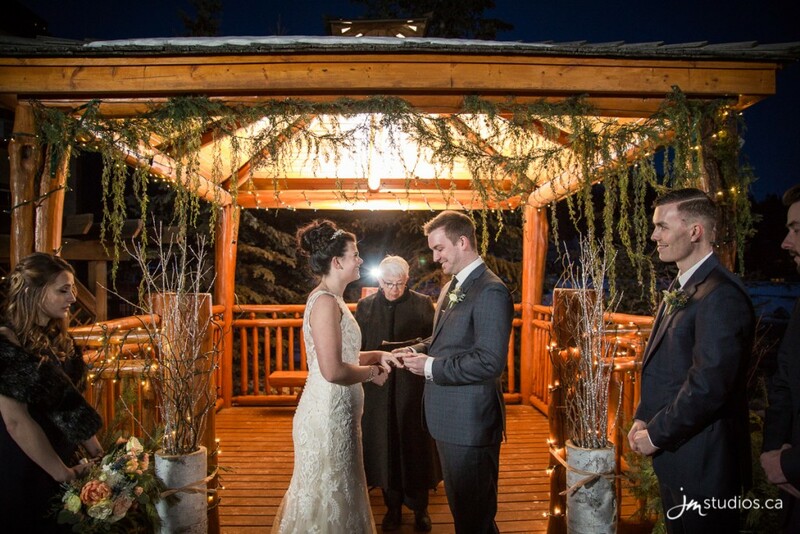 And inside, above the couple, the gazebo glows with light. It is absolutely breathtaking. 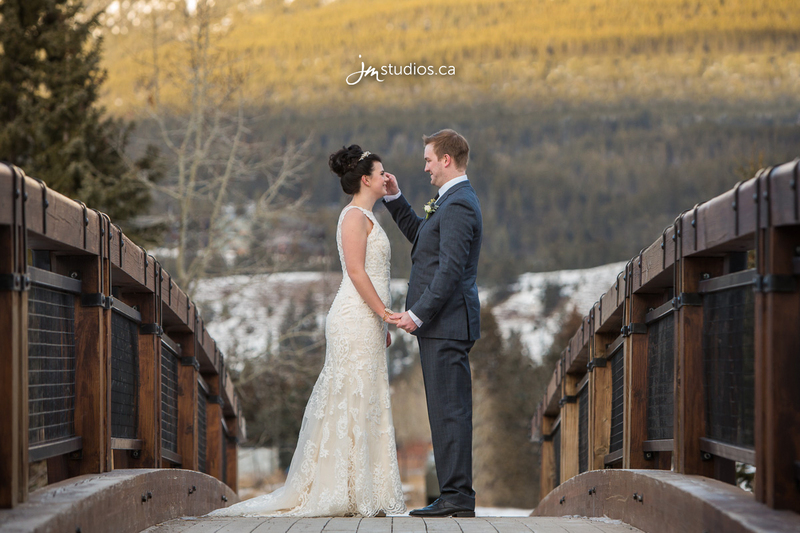 Marion Kutzer of Bow Valley Weddings performed the service. 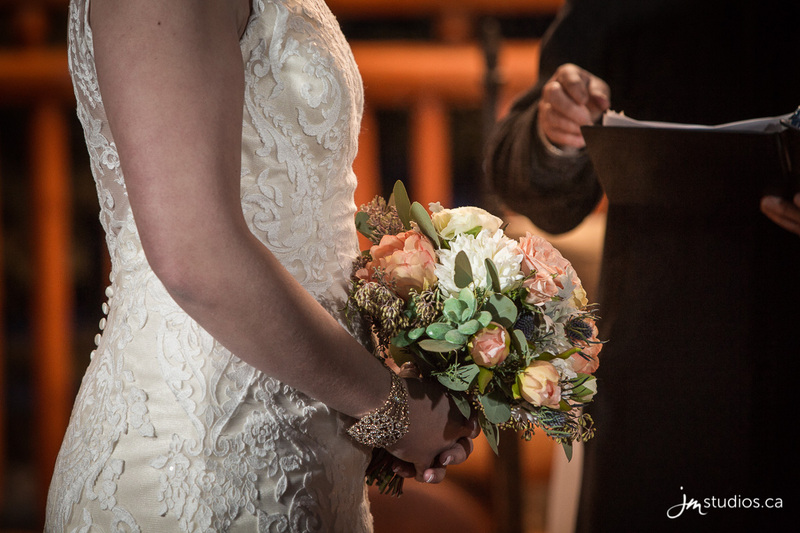 She followed the vows and ring exchange with a love reading. 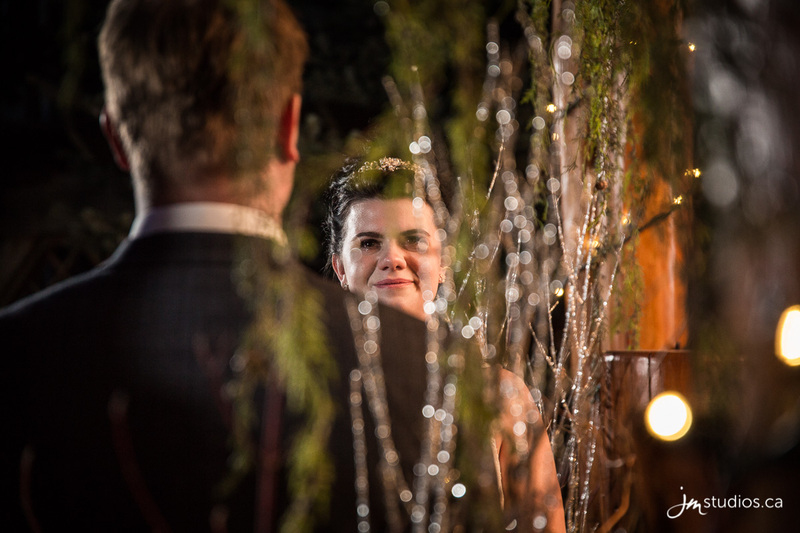 Then, she announced Erica and Luke, for the first time as Mr. and Mrs. Lindholm! 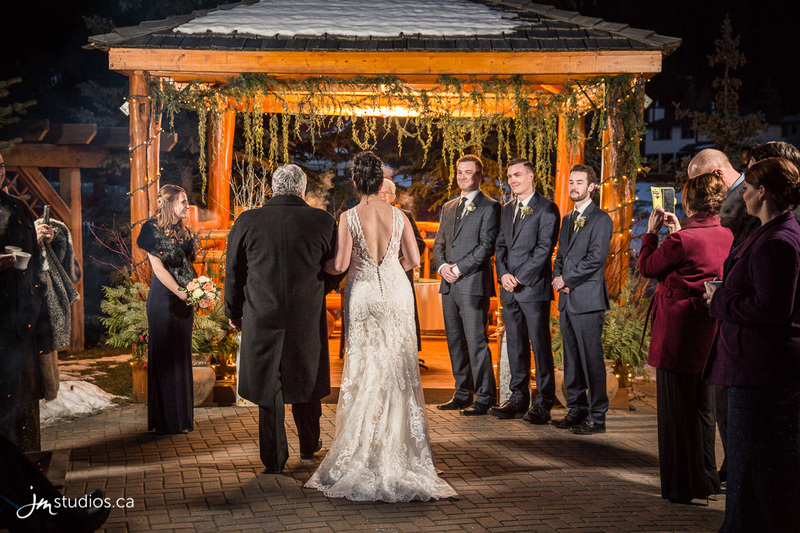 After the beautiful ceremony, the group headed inside, where they enjoyed appetizers and cocktails. Later, they moved into the dinner and reception, prepared by the Inn and their culinary staff. 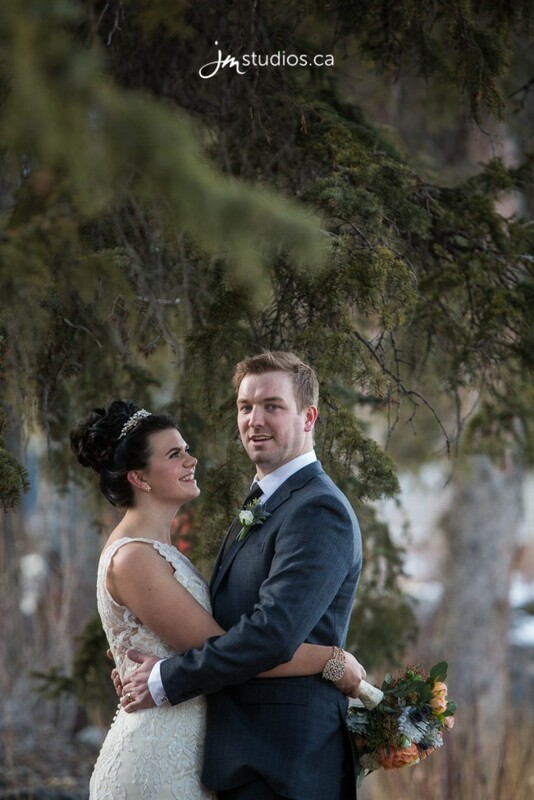 The wedding was stunning, and we look forward to sharing all the Lindholm’s images with them! An online gallery of all their images will be available once they are finished. 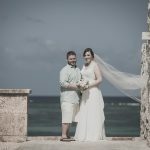 If you click on the link below you will be able to sign up to receive an email notification once the photos are ready. 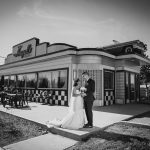 From the online gallery you are able to favourite images, order prints and share the gallery with your family and friends. I have also created a gallery of some of the best images from the day on both our Facebook and Google+ accounts. 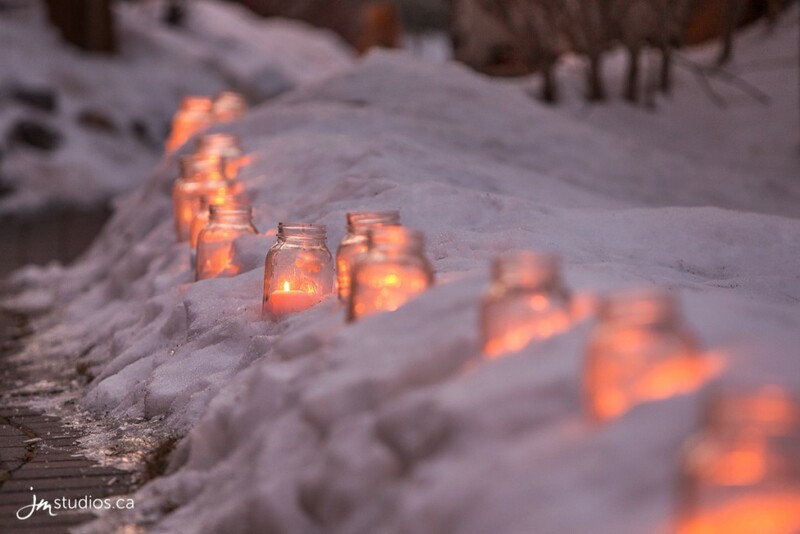 I invite you to visit your preferred stream and share your favourites with your family and friends. JM Photography offers Calgary families the very best in portrait and wedding photography! 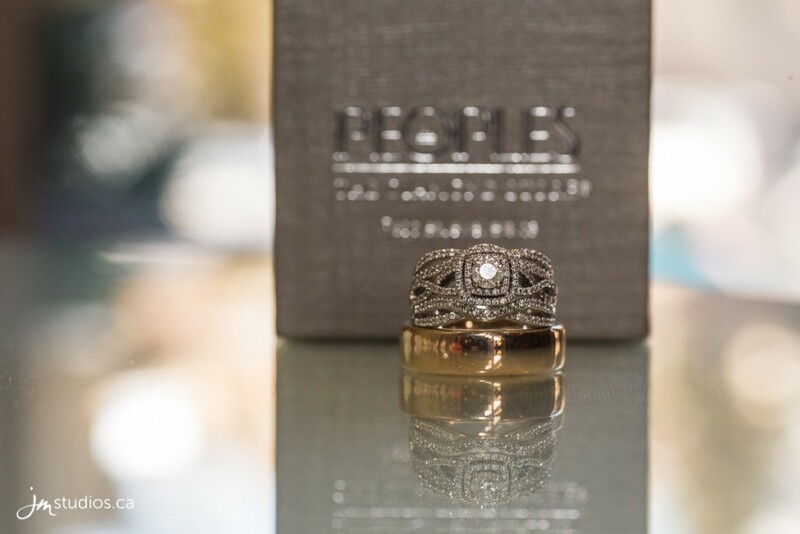 Our unique style and best in class experience is one of a kind. 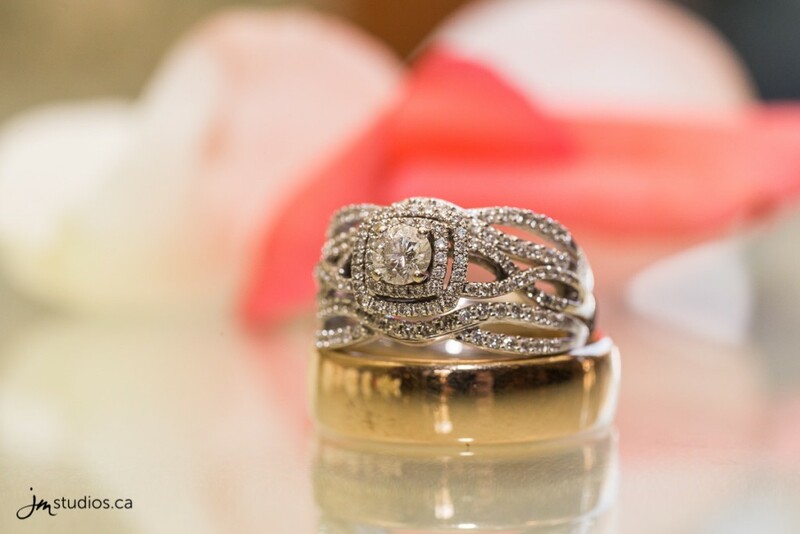 Each session is treated with the greatest of care and creativity, resulting in breathtaking imagery. 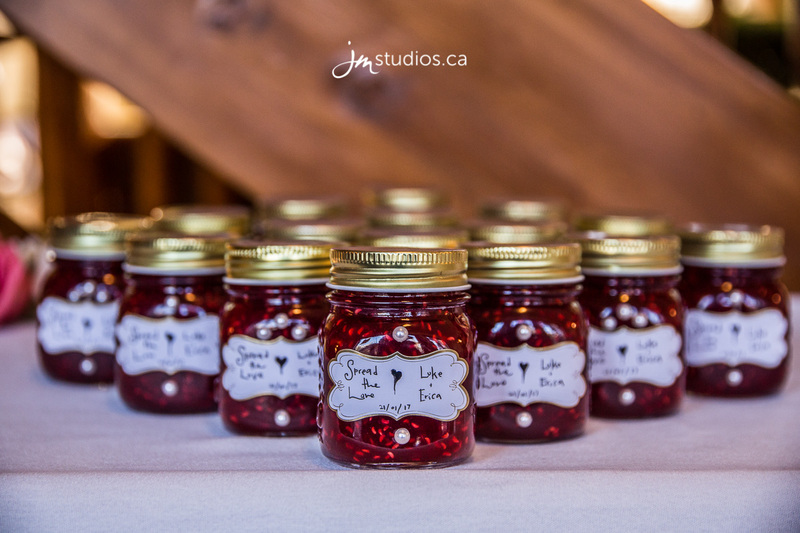 We also offer Calgary newborn photography, capture maternity sessions, portraits and Calgary Wedding Photography.